The history of India speaks when you see the historical monuments and palaces of India. It reflects the heritage, the royalty and the lifestyles of the royalty that once ruled India. Many of these palaces are still private properties, in possession of the royal heirs, and a few have been converted into hotels for tourists. We know living in a palace has been on the to-do list of a lot of people, and it can’t be experienced better than in India that is famous for the services offered by its hospitality sector. Here is a list of seven royal palaces that are open to tourists. NOTE, All these heavy words below can still not justify the beauty of the Palace. There is an abundance of beauty in Mysore Palace. In the royal residence incorporate regal dresses, gifts, melodic instruments and weapons utilized by the Wodeyars are still preserved well. Also, a gem by really popular craftsman Raja Ravi Verma has been found in the Palace. Woah! Let us dig into the history of the famous Mysore Palace. The Palace was built in the 14th Century and has been renewed and reconstructed a lot of times since then for maintenance purpose. The Palace is one of the finest monuments of India and is well known for its heavy tourist attraction. The Mysore Palace was once acclaimed by Wodeyar Maharaja of the Mysore Kingdom today remains as one of the valuable belonging of the country which is now changed over into an exhibition hall. The strikingly decorated and finely etched entryways lead one to lavishly and exquisitely luxurious rooms. The stunningly ordered Durbar Hall, the strong silver entryways, the finely etched mahogany roofs and numerous different embellishments of the royal residence make one hypnotized while giving a thought of the rich way of life of the royals. If we were to talk about the history of the palace it might take us days to finish! Talking about access to the palace for tourist is such that one can visit this beautiful Palace any day from 10 to 5.30. The entry charges are pretty nominal, rupees 40 for adults and 20 for school and junior college students and lastly rupees 200 for foreigners. If you ever find yourself around Mysore do not forget to miss the little piece of heaven. Gujarat has innumerable beauties and one of them is the gorgeous Laxmi Vilas Palace! The Palace is the largest built and is four times the size of Buckingham Palace and is a big time must visit the place of India. The Palace was built in 1890 by Maharaja Sayajirao Gaekwad III. A striking element of the royal residence is its Darbar Hall, which regularly fills in as the scene of music shows and other social occasions. Normal for a Venetian mosaic floor, Belgium recolored glass windows and dividers embellish with mosaic, this corridor opens into an Italianate patio of drinking fountains. Moreover, the 700 sections of a land compound of the castle likewise house different structures, for example, the Moti Baug Palace and the Maharaja Fateh Singh Museum. The Palace once was a school named Motibaug in its compound which was later turned in a museum for people and the tourists. The passageway of this excellent exhibition hall is set apart by a repaired prepare motor of what was at one time a smaller than usual railroad line. The charges for the museum visit are very nominal that is Rs 60 for Indian Nationals, Rs 150/- for foreign nationals, Rs 40 for children & Rs 400/- for a group of 20 school children. This place is a must visit as it reflects the historical center showing a rich gathering of works of art that have a place with the regal family, including artistic creations of Raja Ravi Varma and others delineating Hindu folklore. The lake palace is one of the most popular palaces of India. It was built in the 18th century by white marbles and has been well maintained since then. The palace is now taken over under the Taj group and serves as the finest 5-star palace for tourists. Film James Bond featured few scenes that were shot here. The Lake Palace is situated on the Jag Niwas Island and spreads the entire of 1.5 hectares of the island amidst the Pichola Lake. The Lake Palace is situated on the Jag Niwas Island and spreads the entire of 1.5 hectares of the island amidst the Pichola Lake. It was implied as an illustrious summer castle and now changed over into a five-star royal residence lodging. It is a mystical castle and its picture amidst the lake resembles a leaf straight out of a children’s storybook with an astounding taste of unpredictable craftsmanship and the ethnic topics utilizing the materials and painstaking work all finished feature the magnificence that is basically amazing. The lake around makes a charming mumble with its undulating waves and lapping that adds to the hypnotizing minutes. Soothing and peaceful yet at the same time. It would be heartbreaking to leave this place even if you just stayed here for few hours. Since it is now turned in a grand 5-star hotel, the rate has a justified 5 starred call. The charges are as per the standard 5-star tariffs. Another 5 star Palace taken over by Taj was once a huge dynasty in itself. A royal residence that was worked for the welfare of the average folks is known as the Umaid Bhawan Palace. The richest royal residence, now an inn, was worked in the August region of Jodhpur in Rajasthan, India by Maharana Umaid Singh in the year 1943. The story is with the end goal that as per a tribal prediction, given to the imperial family; there will be a starvation over the Rathore administration. Adventitiously a starvation did come and the kingdom was left shredded. To give work to the out of work ranchers and others, Umaid Singh assembled this royal residence and the farmers got their work as assured. This story about the castle is a stunner in itself. Worked in the driest high place in Jodhpur the royal residence is the living relic of the land. The Makrana marbles and Burmese teak are utilized for inside adornment of the royal residence. The artistic creations and wall paintings of the castle truly deliver the historical backdrop of Rajput rule and greatness. The castle has two primary wings, one is the regal home and other is the in the ‘Taj Umaid Bhawan Palace Jodhpur’. The proprietor of the castle is the grandson of the organizer, Gaj Singh. For vacation spot, a historical center is likewise opened close by the trek of the royal residence. Who wouldn’t want to be here after all this? This one in the list is the Udai Vilas Palace which is in Udaipur, Rajasthan. This palace unlike a symbol of wealth and grandeur of Indian Rajput rulers is a built hotel – resort by the Oberoi groups. It speaks as one of the pride of Udaipur. Udaipur for most of us is a city of palaces and history but it is also a city of well built and competitive market for a lot of businessmen of our nation. The Udai Vilas Palace is constructed at the hunting grounds of Mehwari Maharajas. One can now experience the exact majesty and grandeur of a true palace here any time of the year. The ethnic decorations featuring lotus-shaped pond, fine-crafted domes, wooden furniture, and antiquities depict charm and luxury depicts classic elegance. Though this palace is not an ancient built palace like others it still has the same charm and grandeur like any other palace. 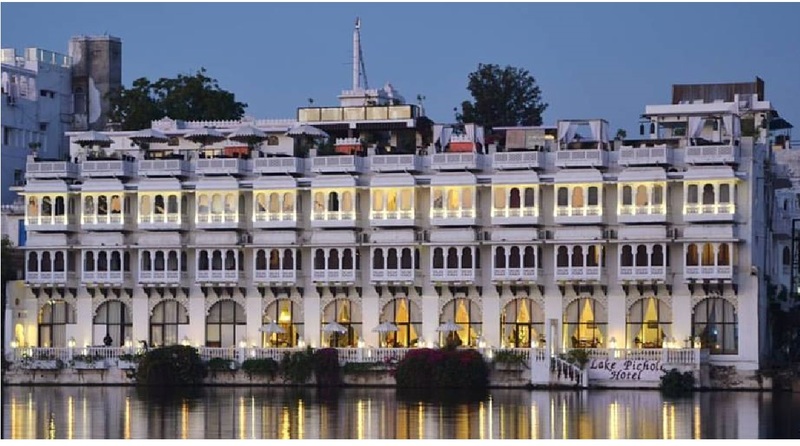 If ever you were to visit Udaipur, do pay a visit here to enjoy elegance at its best, but worried about expenses? Standard 5 start hotel charges applicable. But hey why worry when we are here for you? Now with makemytrip coupons, you can avail up to 20% off on hotel booking. isn’t that just so amazing? Now you can utilize the saved money on your 5-star palace stay! Wuhooo! Who doesn’t know Hawa Mahal??? Hawa Mahal is a generally famous imperial royal palace, because of its construction style. Hawa Mahal truly signifies ‘Castle of Winds’. The royal residence is situated in the excellent city Jaipur. The castle was worked in 1799 by the Maharaja Sawai Pratap Singh Ji. It is presently a standout amongst the most prevalent vacation spots in Jaipur. Hawa Mahal considered as an epitome of Rajputana engineering, the principal feature of Hawa Mahal is its pyramid shape and it’s 953 windows or ‘Jharokhas’ which are embellished with mind-boggling outlines. The story of the palace somewhat goes like this, it is been said that the goal behind the development of the Mahal was to encourage the imperial ladies and give them a perspective of regular day to day existence through the windows, as they never showed up out in the open. Thoughtful huh? The Mahal has its own line of history that gave us this beautiful and astonishing structure. The timings to visit Hawa Mahal is 9 a.m to 5 p.m and the entry fees are rupees 50 for Indians and 200 for foreigners. This place is an absolute must visit for everyone! The last one in the list is Jai Vilas Palace was built in 19th century in Gwalior is an immensely rich and classy palace in my personal opinion and also stated as one of the major tourist attractions of Madhya Pradesh. Jai Vilas Palace Museum was raised route back in the year 1874 by Maharaja Jayaji Rao Scindia and its cost added up to INR 1 crore. Initially worked as a royal residence, it has now been turned into an exhibition hall. Spread in a zone of 12, 40, 771 square feet, the castle has an enormous Durbar Hall, flawlessly outfitted with brilliant light fixtures, plated and gold decorations and a tremendous cover. The ceiling fixtures and the gold leaves in the corridor are the world’s heaviest. There is an immense eating table with a silver train is a feature to look at. This mini train is a table trolley which rotates itself on the table in front of diners so that they can pick up food. The opening hours of the palace is 10 a.m to 5.30 p.m and entry charges are rupees 70 for Indians and rupees 450 for foreigners, maybe a bit higher than other places but indeed a place worth visiting! There are other nominal charges like Camera charges of rupees 70 for photos and rupees 120 for videos. Jai Vilas Palace really stands to the mark and is mind-blowing in all manner. Definitely drop a visit here once in your lifetime as this truly stands as one of the best palaces of India!